Opposition CPM and Congress were to meet affected villagers today when they were stopped from going to the meeting. Anubrata Mondal threatened Congress leader Abdul Mannan and Bikash Bhattacharya of the CPM. 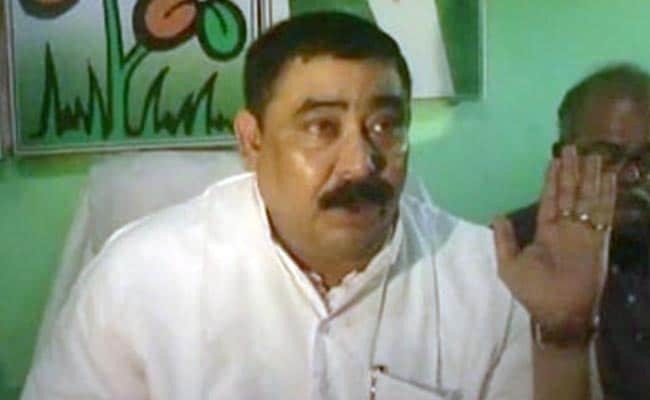 Kolkata: A Trinamool Congress' leader in Birbhum district, Anubrata Mondal, has threatened to break the legs of two opposition leaders if they ever come back to his territory again. "I don't know who they are, I don't care. If they create trouble we will break their arms and legs," he said on Wednesday, a warning that is seen to signal political temperatures heading north in West Bengal ahead of panchayat polls next year. Congress leader Abdul Mannan and Bikash Bhattacharya of the CPM were to meet villagers protesting that the land they had given for an industrial park is now going to be used for a housing colony and a university called Biswa Bangla. But this morning, the stage built for the meeting just three kilometres short of Shantiniketan was torn down by suspected Trinamool supporters. When the two opposition leaders were about 2 km from the broken stage about 160 km north of Kolkata, the police stopped them. The administration told them they could not go further as their presence may trigger a law and order problem. Video footage shows several men, allegedly Trinamool men, carrying sticks blocking the road further up. The two leaders argued and scuffled with the police for about 90 minutes and left for Kolkata. Soon after, Anubrata Mondal arrived at the spot and said: "I don't care who they were ....Congress or CPM or what...The project here is a great development, many people will get jobs and if they create trouble, their arms and legs will be broken. I will not tolerate anyone disturbing the project." Mr Mondal, who was told some villagers had beaten up some Trinamool supporters, ordered the police to immediately arrest the villagers. "If they are not arrested by 9 pm tonight, I will set fire to the house of the villagers," Mr Mondal told police who kept nodding as he issued the orders. "He is a mad person and a goonda combined," said CPM's Bikash Bhattacharya when told of Mr Mondal's threats. "His statement is childish but extremely provocative and he should be made to realise what he has said is criminal. And I want to tell him, we will return to Birbhum again and again." The conflict dates back to the Left Front government acquiring just under 300 acres at Shibpur Mouza near Shantiniketan to set up an industry hub. Later, the Left said, real estate, and not industry, would be developed there. The villagers who had given land protested and the Trinamool, in 2009, led the agitation. This January, however, Mamata Banerjee announced that the state would set up a university on that land. Reports suggested housing colonies would also come up. But as a wall to mark the university boundary began to come up, villagers pulled it down and reportedly manhandled construction workers. The issue seems set to snowball. The Congress and the CPM weren't the only ones to be stopped. 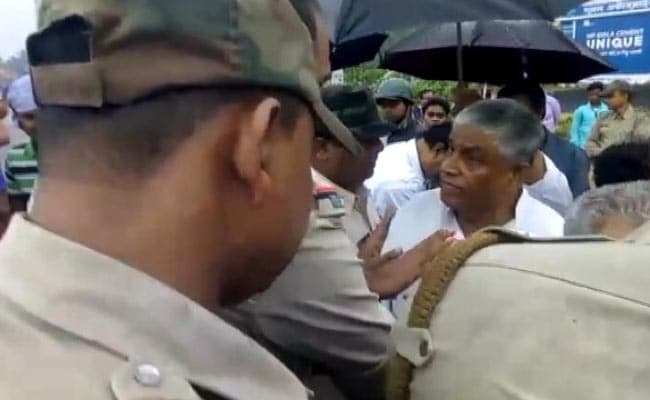 Nearly 500 away, in north Bengal's Cooch Behar district, BJP state chief Dilip Ghosh was also stopped by the police from going to a place called Shitalkuchi that had witnessed some communal tension about a month ago. Mr Ghosh was told that he could not proceed because the police had not been informed of his visit. BJP's newest Bengal leader Mukul Roy said, "The Left used to stop people from voting but opposition could hold meetings and rallies. Now there is no space for opposition in Bengal."